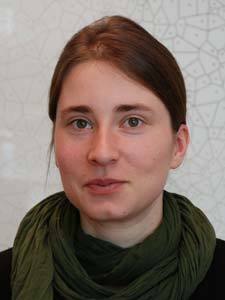 In a recent issue of Journal of Cell Biology (journal impact factor 9.834), PhD student Liliane Christ at Institute for Cancer Research and Centre for Cancer Biomedicine provides new insight into how daughter cells are separated during the end of cell division. In the same issue, a “Biobytes” podcast with group leader Harald Stenmark and co-corresponding author Coen Campsteijn explains the importance of this work, as does a commentary article by two external experts in the field. At the end of cell division, the two daughter cells are separated by the process known as cytokinesis, which culminates in the physical severing of the thin membrane bridge that joins the two cells. This scission is mediated by the so-called ESCRTs, a machinery of protein complexes originally identified for their role in endosomal protein sorting. A filamentous protein complex called ESCRT-III is thought to execute the scission step, but its recruitment to the intercellular membrane bridge has not been clarified. Now, Christ and co-workers show that ESCRT-III is recruited to the intercellular bridge by two parallel "arms". One arm consists of the ESCRT-I and -II complexes, similar to what has been observed previously in endosomal sorting. The other arm consists of an ESCRT-binding protein called ALIX. Importantly, the authors also uncovered an additional function for ALIX, namely in recruitment of a component of the abscission checkpoint that delays abscission in the event of any lagging chromatin in the intercellular bridge. Depletion of ALIX leads to cytokinetic furrow regression in cells with chromatin bridges, resulting in cells with two nuclei, a known risk factor in carcinogenesis. These findings thus provides a novel link between the cytokinetic abscission machinery and the abscission checkpoint, with implications for our understanding of how ESCRT proteins may function as tumour suppressors. 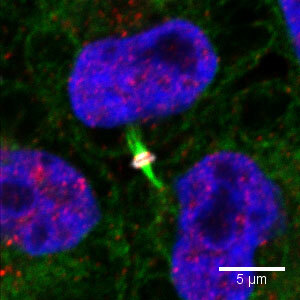 The image shows two daughter cells (nuclei stained blue) depleted of ESCRT-I, joined by an intercellular bridge that contains microtubules (green). ESCRT-III is shown in red. Note the recruitment of ESCRT-III to the midbody (white) in the middle of the intercellular bridge, which is mediated by ALIX. Liliane Christ, Eva M. Wenzel, Knut Liestøl, Camilla Raiborg, Coen Campsteijn and Harald Stenmark. Link to Comment by Frankel and Audhya, entitled "Burning cellular bridges: Two pathways to the big breakup"